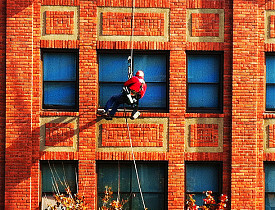 Washing windows, especially the exterior of upper-story windows, is a perennial household challenge. That's why we talked to a professional window cleaner, Vlad Agapov, of Quality Cleaning and Remodeling in Greenfield, MA. Here are the tips we picked up on methods and products to help your window-washing project go more smoothly. drying materials, such as paper towels, lint-free cloth or crumpled newspaper. Rather than ammonia, Agapov prefers to use Unger products, which can be purchased at big box stores and online. These products are "environmentally preferable", come in a variety of solutions and are gentler on your skin than ammonia. If you want to use a green DIY product, mix ¼ cup white vinegar with 1 gallon water to wash your windows. When it comes to drying materials, Agapov reveals that he uses the cheapest paper towels, because “the inexpensive paper towels are as lint-free as any other.” Crumpled newspaper also works well, and it's a great way to repurpose a material that might otherwise get thrown away. Next, he recommends that you scrub the glass pane with your soft sponge dipped in cleaning solution, then squeegee and/or dry with drying materials. When using a squeegee, it is best to overlap your strokes starting partially on a dry area. Wipe your blade often and clean up any drips. Depending on where you live, you may experience the effects of acid rain or hard water deposits -- for example, from garden sprinkler spray that hits the windows. Hard water deposits, which often appear as a white powdery substance, are a challenge to clean. There are cleaning products designed to address mineral/hard water deposits or you can just use more elbow grease. Acid rain can be damaging to windowpanes and sometimes creates “etching” where dirt can get trapped. If it’s an older window, Agapov recommends taking extra care when there is heavy etching, as the glass may break more easily. Cris Carl writes for networx.com.